The world in which our children live is imbued with materialism. For many, the only thing that counts is what they can see and touch. If there is one thing that is forgotten today in education, as in every other sphere of human activity, it is the value of the immortal soul. Throughout the teaching of the Catholic faith, one of the goals of a school is to reveal to a child, the world of the supernatural life. A child, like all men, is not just called to a natural perfection, and even less just to a perfection of knowledge. He discovers little by little the meaning of existence and the call to an eternal happiness. We are created for heaven, and yet we think so little about it, perhaps not even once. However, our souls have greatly a thirst for the living God. 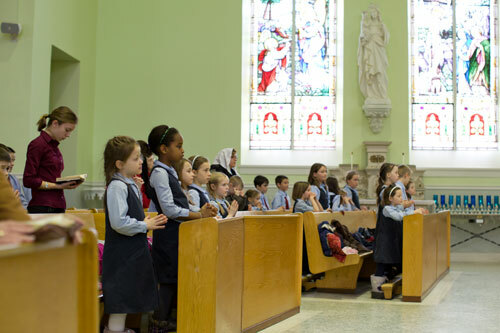 Catechism at the school gives the child the quenching of his thirst for the true and the good. He discovers daily the benefits of a Christian environment in which the God is a Father for His children. We initiate the children into the life of prayer and the taste for silence which opens him to the things above and avoids placing mere academic results as the ultimate end. For, if one forms “little geniuses” who do not know how to love God, or even simply to say “good morning” or “thank you,” they will never be wholly formed men, and even less, saints. The practice of the basic virtues of charity, service, making an effort, and of courage, contribute in forming the good soil in which divine grace will take root and bear much beautiful fruit. The children are initiated into the life of receiving the Sacraments and go to Mass once a week, celebrated in the Extraordinary Form of the Roman Rite which expresses perfectly the meaning of holiness and shows this clearly to the children. The child thus may discover the riches of the Catholic religion (catechism, liturgy, the lives of the saints) which favours the harmonious development of his person. Dear parents, when you enroll your children at l’École Notre-Dame du Mont Carmel, you give them the chance to discover life and truth. You open for them a little bit more, the royal path to heaven.